You may already know about a ministry called GOSPEL FOR ASIA. It is a ministry that shares the love of Jesus and the Gospel message with people of all ages in South Asia. The majority of the world's Hindus, Muslims, and Buddhists live in this area. K.P. 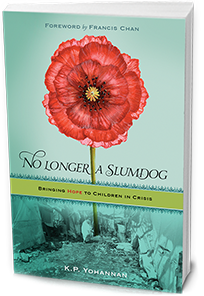 Yohannan, the Founder of Gospel for Asia, has written a book called, "No Longer A Slumdog: Bringing Hope to Children in Crisis." It is an eye-opening book about the heart-breaking stories of children who were born into the low end of a Hindu caste system. This means their Hindu social status makes them "good enough" for only living in the slums to beg and work for pennies. Some are abandoned unexpectedly, and some are sold into slavery. And, as long as they remain followers of the Hindu religion, there is no chance for them to change or move up the ladder. They are stuck. The beginning of the book was very disturbing to me. I did not like reading about the horrible lives these children are forced to endure. But, these stories are necessary to show what life is like for these people. Further into the book, hope begins to arise as the author shares the work of Gospel for Asia and how they are making a difference in so many lives. You can get a FREE copy of this book and read for yourself the work being done through Gospel for Asia, and also find out how you can help. Both the book and the website list different ways for us to get involved with this ministry and be a part of rescuing these children from hopelessness and despair.